The right golf push cart can make a huge difference in the amount of enjoyment you get on the golf course. A product with the right features and design will last for many years and save you from having to carry your clubs uphill. The best carts for the money will enable you to carry your drinks, extra balls and umbrella without getting slowed down by rough terrain or steep inclines. Many push cart owners have dealt with products that don’t live up to expectations. Some have flimsy straps, bad wheel alignment and other problems. CaddyTek SuperLite Deluxe is a popular choice because it doesn’t have any of these issues and happens to be one of the most affordable carts on the market. The cart has a sturdy steel frame as well as plastic club holders with heavy tether cords. The handle features an adjustable angle position that helpfully accommodates people of different heights. The brake works very well, and you can spend all day on the course without any wheel alignment issues. Assembling the cart is easy, but the product may be heavy to carry in and out of a car for children or small adults. 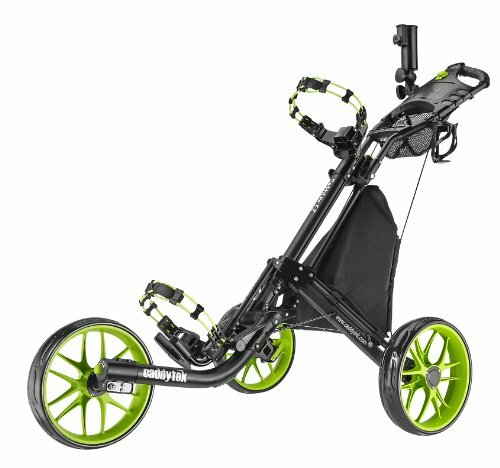 Most golfers will have no problem, and when it’s folded, the cart fits perfectly in any trunk. 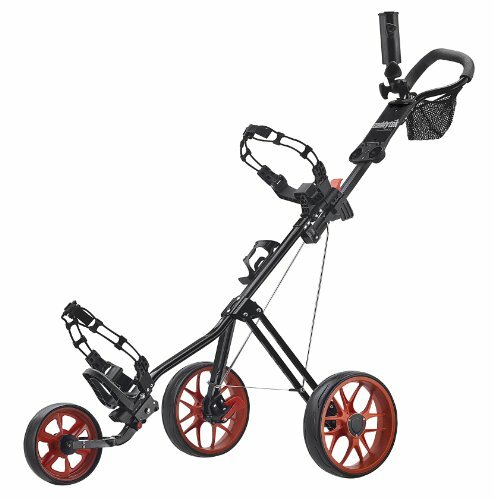 The adjustable bag holders are designed to fit any type of golf bag, so if you’re looking for a push cart that performs well without being overpriced, this is the one for you. It’s very lightweight, remains well-aligned and rolls easily. You’ll have to disassemble it to fit in a small car, but this is true for any golf cart. This cart is one of the nicest-looking products on the market, and it’s noticeably sturdier than most other carts in its price range, such as SunMountain, Callaway and Bagboy. When you want to fold or unfold the cart, all you have to do is pull on a couple of small levers, which many people will find easier than twisting a knob. There are quite a few accessories available with this cart. The hand brake is a nice feature because it’s located on the handle rather than near the wheels where most foot brakes are located. 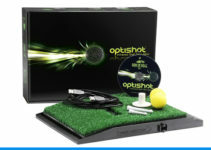 It can be much easier to use for many golfers. It includes a cup holder, and many people may not even notice this feature until they closely examine their purchase. While this cart is quite large and heavy, most users agree that it maneuvers well for its size. 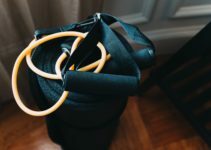 The straps require some careful attention to prevent them from becoming loose, so it’s a good idea to make sure the elastic is locked tightly into the guides. There may be some extra slack, but it shouldn’t be a problem for most golfers. When it’s folded, this cart is somewhat wider than other products in its price range. Overall, this cart is popular because it’s attractive, convenient, functional and has many useful accessories. The quality and usefulness of this cart are unbelievable, and it comes with an adjustable umbrella holder that can be folded and unfolded with the push of a button. When folded, it becomes very small and compact. It weighs next to nothing, and all you have to do is throw it in your trunk when you’re ready to hit the course. It’s a great little push cart for the money. While others may have additional features, they tend to cost significantly more, and most people will be perfectly satisfied with this product. It’s extremely sturdy, well-built, easy to use and functional. Users recommend it highly and would purchase another one if they needed it. Some owners complain that it has a foot brake instead of a hand brake. Others point out that it doesn’t have a locking mechanism to keep the cart folded up when it’s collapsed. You can simply keep it fastened down with a bungee cord if necessary. This cart has quite a few accessories, including an umbrella holder, cup holder, tee holders, two ball bags, club covers and many other items golfers often carry with them. It also features a well-insulated cooler that can hold ice and drinks. One of its best features is the adjustable height of its handle, which is a nice touch for very tall or very short golfers. It also has a notch on the top bag holder to keep a stand bag from becoming twisted. This cart is easy to push over just about any type of surface, and you should never have to worry about tipping it over. It includes a lot of storage room to fit small items such as sunglasses, extra balls, a smartphone, bottles of water and other necessities. It has a one-click folding mechanism that works very well, and the overall quality of the cart will assure anyone that it will last for many years. This model is slightly more expensive because it includes an insulated cooler for drinks. While the cooler is somewhat small, it’s very effective and should suit the needs of most golfers. The foot brake is very effective, but it might put off some users who are used to squeezing a hand brake instead. A few important points to note, however, are that the brake is slightly more difficult to reach and somewhat hard to tell if it’s engaged or not. Whatever you do, be sure to unlock the brake before trying to push the cart. After using it for five minutes or so, you’ll have a perfect sense of how to operate the foot brake. One of the best features of this cart is that it collapses easily with the push of a button. However, it’s less easy to raise it from a folded position, especially with one hand. It can simply take a few minutes to learn the right way to do it. All in all, it’s a light cart that is easy to maneuver. It’s a big upgrade for anyone who is familiar with old pull carts, and it will be much easier to use for anyone with a bad back. 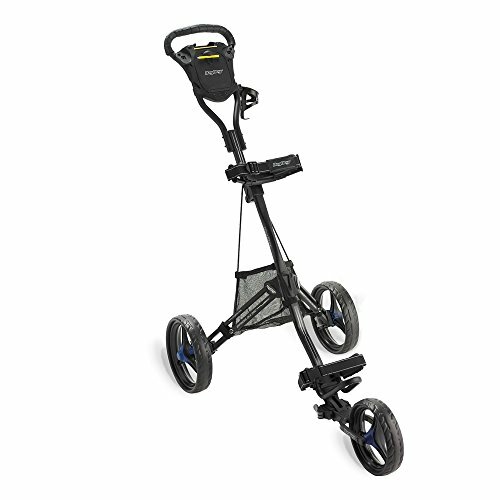 This cart is very sturdy and includes a heavy bag to hold all your golfing accessories. Your belongings will fit perfectly in the carrying bag, and the wheels are designed to work very well. The only complaint most golfers have made about this cart is that the cup holder doesn’t adjust to inclines or declines when pushing the cart over hills. For the price, it’s a wonderful little cart with a lot of excellent value. It’s extremely easy to set up. You’ll find that the wheels easily pop on and off with a simple push of a button, making it convenient to slide into the trunk of a compact car. 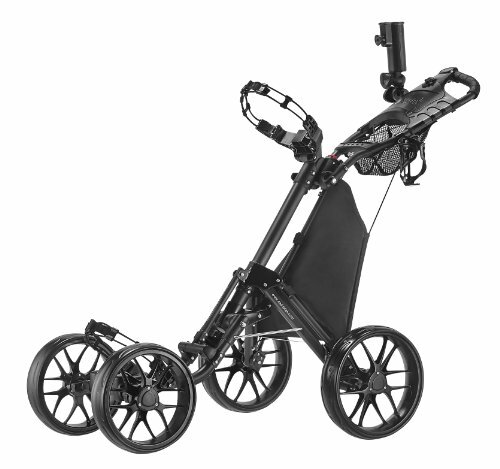 The cart easily navigates tough terrain on the golf course. The design of this cart will comfortably fit most stand bags, and the straps are very easy to wrap around the bag. You’ll have no trouble putting water bottles and extra balls in your bag, and accessing them during your game will be easy. 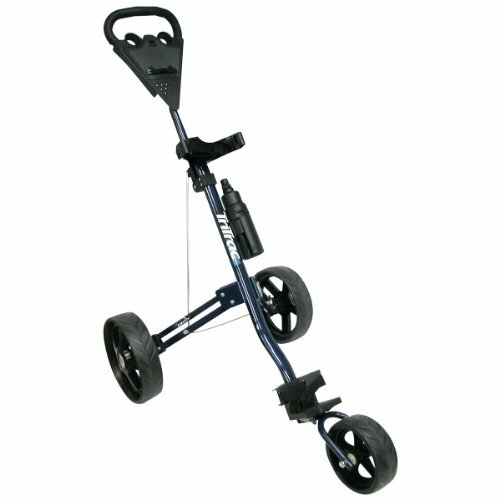 Most golfers say that pushing this cart over rocks and gravel is very smooth and convenient. This is a convenient cart that’s easy to open and close, even if you happen to be a small person. It easily glides over grass, and while the brake handle may be a little stiff, it tends to get easier with use. One great feature is the large amount of storage area. There is a lot of room for all the small items that a golfer uses during a game. The ball holder is located in the console, and the net holds a large number of items. If you find yourself playing in the rain, you’ll appreciate the umbrella storage because it’s cleverly tucked away. Overall, this cart feels sturdy to use, and the handle is comfortable to hold. A small person may feel that the handle is too high, but with a simple adjustment, the height will be just right. Whether it’s raining or excessively bright outside, the attached umbrella holder will provide shelter and shade while you play. The beverage holders are easy to mount and work quite well. Another great feature is the bag strap, which separates this cart from products that don’t have a strap. This is a new model, and it still doesn’t have as many of the accessories as the earlier model has. Although a lot of the available accessories will fit on any model of the Clicgear cart, a cooler bag is unfortunately not one of them. 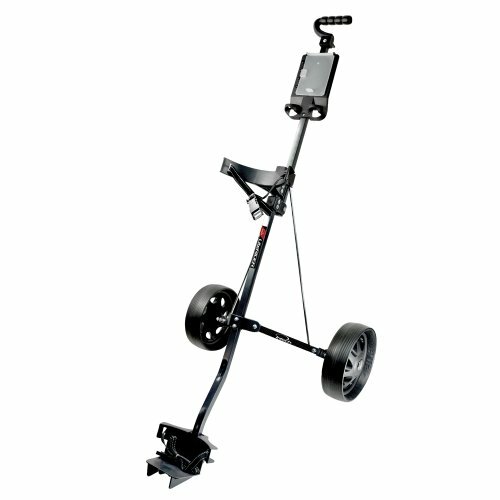 This is a very inexpensive cart, and players will want to know that it doesn’t have a hand brake or a foot brake. For a model in this price range, however, it’s easy to find a workaround. When using this cart, you will have to carry your own drink because it doesn’t have a drink holder. Most golfers will agree that it has a first-rate entry-level set of features, including a ball holder, tee holder, scorecard holder, folding assembly, three wheels and quality design. You can fold it up with the cart still in it, and will easily fit in the trunk of a compact car. The best feature of this cart is its exceptional value. 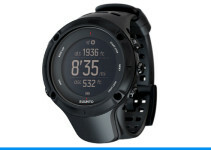 It has a good overall quality and acceptable feature set, but most importantly, the price is very low. You may want to know that it tends to lean to one side during use, but this issue is minor and easy to ignore. If it becomes a problem, you can simply push the cart with your right hand instead of your left. This cart has a handle that conveniently folds down, causing the wheels to retract inward at an angle for easy storage. The entire assembly collapses inward to make it easier to put your bag in the trunk of a small car. It includes several tee holders, ball holders and pencil holders for score-keeping. It also includes a water bottle and holder on one side of the frame. 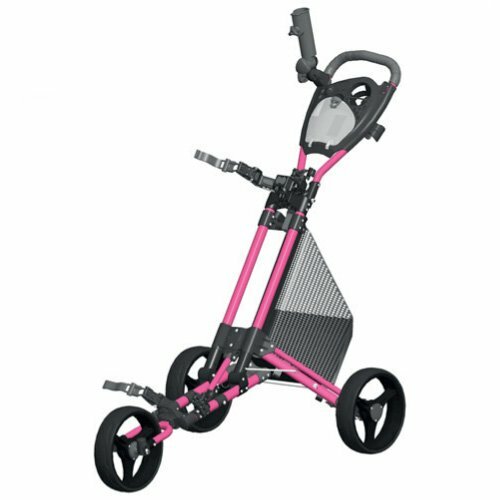 Overall, it rides smoothly although a golf bag may have a tendency to turn sideways, a common issue with most carts in this price range. A typical complaint about this model is that the scorecard holder may become detached while you’re playing. Most users have not experienced this problem although the card does tend to slide significantly in its holder. The pencil holder is another feature that could present an issue on rough terrain because the pencil tends to slide out. For a cart that costs around $35, it’s more than worth the money. It’s easy to put together, requiring just a few screw to fasten the wheels into place. It can be pulled or pushed, and someone with a bad back may find it easier to push because it’s such a light cart. 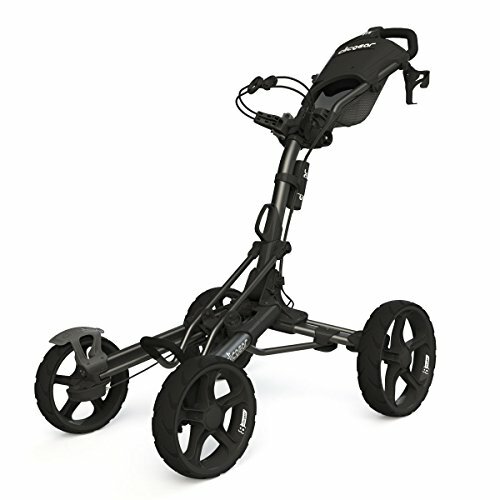 It has large, wide wheels that seem to roll as easily on the fairway as on a foot path. It folds up very easily and fits in any car trunk with the bag still attached. The design is attractive, and the cart is well-constructed. This is a very simple golf cart that doesn’t include any cables. It has a useful pouch located between the wheels. Few other carts have this feature, and it can make carrying water bottles much easier on hot days. The pouch can easily accommodate a 1-gallon carton of water, so you should have no issues with dehydration while out on the course. For an entry-level cart, this product is ideal. It can fit into most compact cars without detaching the bag from the frame. Although unfolding the wheels and assembly can be challenging without removing the bag, it becomes easier as you get used to the process. One of the best features of this cart is that it can be assembled in about 10 minutes. 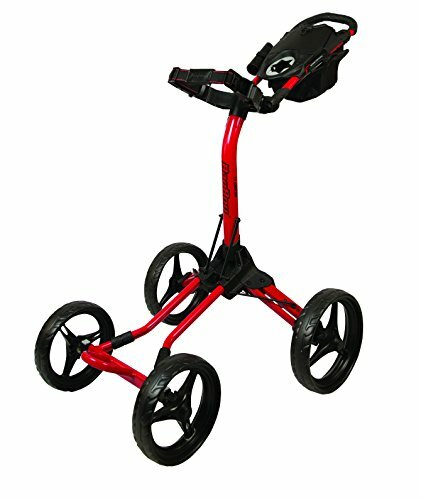 It includes a foot brake that can come in handy, and using this cart with a bag of clubs is no problem for golfers of all sizes. Some of the great features of this cart include a magnetic fastener for the storage box, a convenient pocket bag and a number of useful zippered pockets for holding various items. It easily carries extra golf balls and a cell phone, and you can put a putter cover inside it when you’re making your shot. While a zipper is a nice feature for keeping items inside a pocket, it requires two hands to operate. The magnetic snap of this cart eliminates this issue so that you can focus on your game without worrying about dropping the items you’re carrying. It’s very easy to fold and unfold, and when it’s collapsed, it can fit in your car with room to spare. Most people will have no problem carrying, pushing or moving this cart. This cart is very sturdy and well-made. It’s cleverly designed and has a good, solid quality. The folding assembly is easy to use, but you have to remove your bag and umbrella before you can fold it. Some carts allow you to leave your bag attached when you fold them, but this one takes a little less than a minute to unfold and attach to your bag. It includes a handy umbrella holder and a durable cargo net for carrying odds and ends. 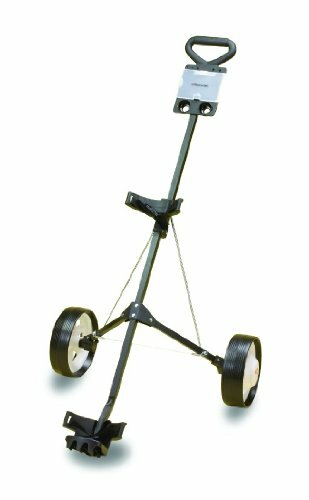 There should be no problem attaching a stand bag because the cart has cutouts for the legs and foot pedal, allowing the bag to sit evenly on the cart. Although this cart is a little heavy, it’s very easy to fold and unfold. Its features add a great value to the product, and you’ll enjoy using the foot brake, umbrella holder and storage area for extra tees and balls. When you’re ready to invest in a push cart, you’ll begin to see your game improve as you find it easier to spend time on the fairway practicing. Before spending your money, take time to think about the features that are important for your game.